With just a couple of months out from launch, I’m excited to share an app sneak peek with you today! With a ton of feedback from our community, and tinkering behind the final design, it’s finally all coming together. We’ll give you two accounts: Saver and Super. Hook up the Saver account to your bank and start stashing money away without locking it up in super. You can access the money in your Saver account anytime if you need to. Give yourself a buffer by letting us know how many weeks worth of savings you always want available in your Saver account (this will be your Buffer Amount). Then, once a quarter, we’ll transfer everything over that amount into your Super account to build your retirement savings. Everyone knows that super is a great way to save for retirement. What most Australians don’t know is that you can also use it to reduce your taxable income. To do this, you first need to make your Personal Contributions tax deductible by printing out and sending your fund a Notice of Intention to Claim. 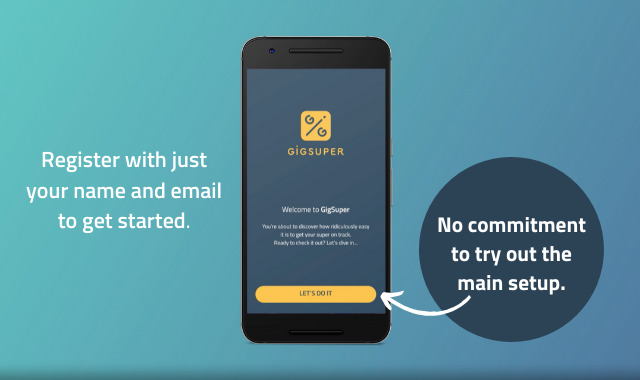 With GigSuper you can go totally pro and automatically generate your Notice of Intention to Claim every time you make a Personal Contribution. And we’ll email you the receipt at tax time to forward onto your accountant. As always, if you have any feedback or questions, hit us up at hello@gigsuper.com.au and we’ll be happy to chat. Get all GigSuper News Updates to your inbox. Join our pre-launch mailing list now to see how we’ve made it ridiculously easy to get your super on track. You’re all signed up - great to have you on board. These results are for illustrative purposes only and do not represent actual or expected returns that any particular investor might experience. Tax rates on income and capital gains both inside and outside super remaining constant which may not occur. A steady inflation rate of 2.5% which may not occur. The prospective financial information provided is not a reliable indicator of future performance in that it is predictive in nature and may be affected by inaccurate assumptions, unknown risks and other uncertainties. Therefore, the prospective financial information may differ materially from the results ultimately achieved. The above comparison in no way constitutes advice to invest in any particular investment product and we recommend you seek independent financial advice before deciding whether investing in super or non-super products is right for you. © 2019 GigSuper Pty Ltd - All rights reserved. This website has been issued by GigSuper Pty Ltd "GigSuper" (ABN 32 620 862 053) of Goods Shed North, 710 Collins St, Docklands VIC 3008. GigSuper does not currently offer any financial products. We will shortly be appointing an APRA regulated RSE Licensee who will be responsible for issuing the financial products associated with GigSuper. After this time, you will be able to find the Product Disclosure Statement (PDS) on our website. You should always consider the PDS in deciding whether to acquire any financial product.